Even though all the fish you eat, whether in raw or cooked form, is technically dead, the term “dead fish” conjures up images of scaly carcasses washed up on a beach. Needless to say, that’s not very appetizing. However, The Dead Fish in Crockett gives reason to love its namesake with their food and stunning atmosphere. The Dead Fish is located about 25 minutes North of Walnut Creek. It is just up the coast from Martinez, and across the Bay from Vallejo. It’s worth discovering, if only for its endless view of the Carquinez Straits. 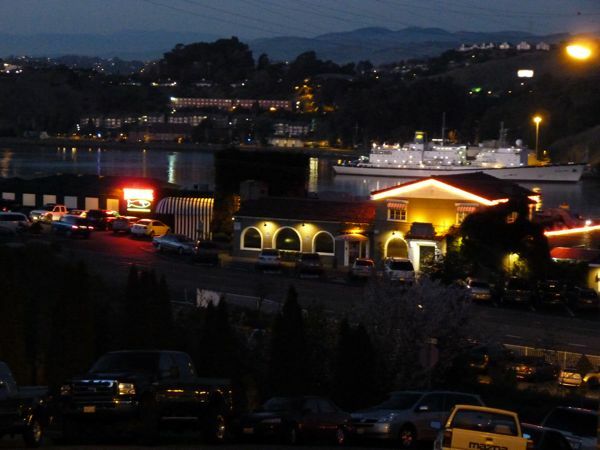 That’s the first thing that catches your eye when you arrive at the restaurant: round-the-dining-room views of the water, the lit-up bridge, and the hills that accentuate both. The owners of The Dead Fish also own such Bay Area seafood hotspots as Franciscan Crab Restaurant on Fisherman’s Wharf, The Stinking Rose in North Beach, and Salito’s in Sausalito. For what it’s worth, The Dead Fish gets its name from the chef’s Nonna, who cooked for a large family, and couldn’t keep track of all the different recipes she prepared. So, when the chef (her grandson) asked what kind of fish she cooked, she told him, “It’s a dead fish!” Hilarious! Anyway, the food itself at The Dead Fish is what you’ll come for as they are known for their Dungeness crab, which is only bought if it weighs more than two pounds (to ensure peak meatiness), and is only caught in the Pacific Ocean. They do have options for prime rib, filet mignon, and other non-seafood meals. Menus are subject to change daily, so make sure you check online before you go! I went for lunch. when the atmosphere is a little more light-hearted and not as crowded and you can fully make out the little decorations hanging from the ceiling. From all the photos I’ve seen, it is more of a dimly-lit, low-key vibe in there for dinner. Anyway, the food was good but not as incredible as the reviews said it would be. I still enjoyed my meal though! I had the asparagus with blue cheese and the single crab enchilada. Overall, I’d give The Dead Fish 3.5 Mt. Diablo’s out of 5. For all the beautiful, picturesque landscapes in California, it seems like the Central coast can often be overlooked. Everyone knows about the National Parks, Lake Tahoe, San Francisco, the SoCal beaches, etc. But one of the best gems of the entire state is just a couple hours South of the East Bay! If you’ve never taken a trip down the Pacific Coast Highway to reach the 17-mile drive through Carmel and Monterey, you don’t know what you’re missing! You’ll hit miles of stunning coastline, as well as some of the cutest inland towns you can imagine. One of my favorite day trips is a jaunt down to Carmel. I love all the little shops, restaurants and the beautiful beach to enjoy the Pacific Ocean at sunset. Carmel is also very dog-friendly – it seems that everybody has a dog and they are free to run on the beach (where most gravitate to the right side). I have even gone to a Weimaraner gathering here. Anybody who has rescued a Weim from NorCal Weim Rescue gets an invite. It is a fun sight to see: a bunch of Weimaraners playing and frolicking in the waves. Monterey and Carmel also have a great wine scene and amazing golf. It’s such an easy trip, and so close to home. I recently did the 17-mile drive; that was a first for me after all these years and definitely worth the money and scenic stops. Now might be the perfect time to go, too. It is Fall, so the leaves will be brilliant and the weather will be perfectly crisp…a perfect day for a stroll on the beach, as long as you are bundled up and there is no fog!